There’s a saying that goes something like: “There are no such things as strangers, just friends you haven’t met yet.” Trite? Perhaps. True? Well, at least based on our encounters during a recent trip to Ireland, I’d have to say yes. An American couple walked into a local pub. (Sounds like the start to a bad, possibly risque joke, doesn’t it?) Anyhow. The pub was Sheridan’s in Ennisnag, located near the Lawcus Farm Guest House, a delightful bed and breakfast outside of Kilkenny where we were spending a few nights. (More on the B&B in another post, since it’s so very worth discussing.) We would never have thought to stop in at Sheridan’s, but the B&B owner had suggested we might enjoy grabbing a pint there. So after a full day of touring the surrounding countryside and with some time before dinner, we decided to stop in for a few minutes. Picture, if you will, the two of us, clearly outsiders, walking through the door of Sheridan’s, which was about half full with maybe a dozen men—not another woman in sight, mind you. Like in the old Westerns, every head turned to look at us, and all conversation temporarily came to a halt. Hmm. Well, it was maybe not the most auspicious beginning, but I’m not exaggerating when I say that it turned out to be one of the best evenings of our entire visit to Ireland. By the time we walked out a few hours later, we were on a first-name basis with almost everyone there, including Donnie, the proprietor, who knows how to pull a Guinness properly and spoke knowledgeably of everything from his travels around the world (Egypt, Pompeii, Mexico) to the locals buried in the cemetery across the street, with a bawdy joke thrown in for good measure. We chatted with Willie, who works for a local gas company, and Willie’s father, Frank, a retired dairy farmer. Charming men, both of them, and so warm and welcoming once the initial reserve had quickly worn off. In fact, thanks to Frank’s generosity, glasses of Guinness kept appearing in front of us, and he would never hear of our buying the next round. When we finally took our leave, it was accompanied by handshakes and hugs all around and sincere invitations to come back to Sheridan’s and visit our new friends the next time we find ourselves in Ennisnag. You know, I think we just might take them up on those invitations. 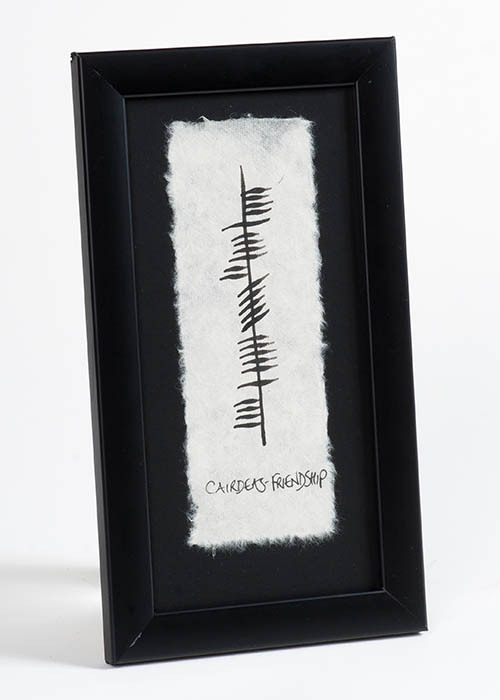 In the meantime, this lovely Ogham Wish wall art, individually handpainted on handmade paper in Ogham script (Ireland’s ancient alphabet) by well-known Irish artist Ethel Kelly, brings back good memories of the friendships we made in Ireland. Introducing Ever Irish Gifts—The widest selection of Irish and Celtic gift items on the web! So you may be thinking, “Yet another web site selling Irish and Celtic gifts. Big deal.” And if you are, we don’t really blame you. Because do a quick Google search on “Irish gifts,” and literally thousands of sites pop up. Then why are we so excited about Ever Irish Gifts, and what makes our site different from all the others? Thought you’d never ask. What makes us different is what’s going to make you the best gift-giver ever. From personalized and very personally meaningful wedding gifts to one-of-a-kind pendants featuring original Irish postage stamps, we’re certain you’ll find that special thing that will make your gift stand out from the rest. And while Ever Irish Gifts is still a work in progress, we’re constantly building our inventory to offer you new and intriguing products for your perusal. Men’s and women’s Irish wool sweaters? Coming this fall. Celtic drinking horns, crafted from genuine naturally shed cows horn? Watch this space. There’s so much more coming soon; visit us regularly to see what’s new. So welcome to something fresh and different—Ever Irish Gifts.